Have you been hounded by spam like requests from Indian SEO companies offering SEO for $300/month and quite a poor sales pitch? Are you, although unsure about the ROI, tempted by the low prices? A Monday email from this “SEO expert in India” prompted me to probe it further. 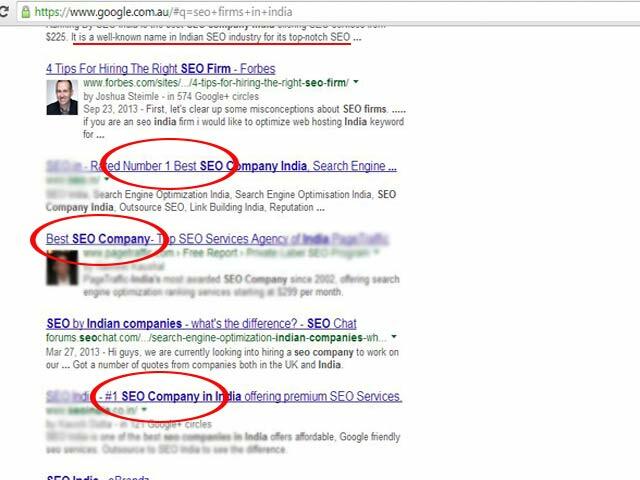 A search for SEO services in India on www.google.com.au revealed that most are trying to entice Australian business with their low price SEO and fuzzy promises guarantying top ranks. Most companies offer monthly SEO packages between $200 and $300 – Is it workable? No. A 10-page website has different requirements from a 100-page website and SEO firms cannot be crafting fit-for-all packages because obviously, there is no size that fits all. Do not fall for the fixed price, even if you are tempted because it is so low. Bad SEO can get your website blacklisted over time. Some of them claim to be Award-winning, Best, No. 1 (bizarrely, several companies were No. 1. – Can they be? No. Steer clear of the sophist’s promise. Almost all claim to take you to the coveted top spot on search engine result pages (SERPs) – If 5 clothing companies hire them, how can they all get the first rank for the same keyword? And the companies that promise money-back guarantee, are they going to pay back 4 out of these 5 clients? I think not. Use caution – If it is too good to be true, it is probably not true. What do the clients say? Are they even real? Many of them have a long list of clients including the likes of Microsoft, Discovery Chanel, Virgin Mobile, Calvin Klein. Microsoft hiring SEO services for $300/month – doesn’t that seem odd to you? This causes me to be suspicious enough to prod it more from here. I’m not advising against outsourcing to Indian SEO companies. The lower cost of living in India allows for cheap SEO services (and everything else) and who wouldn’t like good services at a lesser cost? But the question is about the legitimacy of the claims these SEO firms make. Don’t be misled by the false promises. With Google advising against quick schemes like backlinks from article directories and declaring that guest posting is dying, I’m not sure what they will keep doing to justify a monthly fees. Unless, ofcourse they are hired for writing content. Google launched 665 algorithm updates in 2012 and the way search is evolving, I don’t see anything less-than-authentic having a chance to survive. If you know the basics of SEO writing , you can just do it yourself every time you post a new article. If you don’t have the time for self-SEO, do a little research and be precise about what you want from your SEO guy. Discuss your requirements, your target clients, and your competitors with the internet marketing company in India or in Australia or anywhere you find a good one, and see if they are able to devise a plan that seems legitimate. Ask for the details, and if, at the end of the discussion, you find yourself confused about what they are going to do, look elsewhere.